There’s a Massage Waiting for You. Come On By! Stay A While. Enjoy A Massage. Hello Rockaway Beach, New York Neighbors! Did you know there is a renowned massage therapist right in your Rockaway Beach, New York backyard? That’s Right! Owner, Wellness Facilitator & Licensed Massage Therapist; Samantha Cintron has been practicing Massage Therapy for over 15 years. Samantha’s spectrum of clients range from professional athletes & celebrities to fitness instructors, business professionals, and all walks of life. Samantha has worked as a leading spa therapist & supervisor in some of the finest, luxury hotels and spas in New York City including, The Spa at The Mandarin Oriental, La Prairie at The Ritz Carlton, Guerlain Spa at The Waldorf Astoria, and Sisley Spa at The Carlyle. 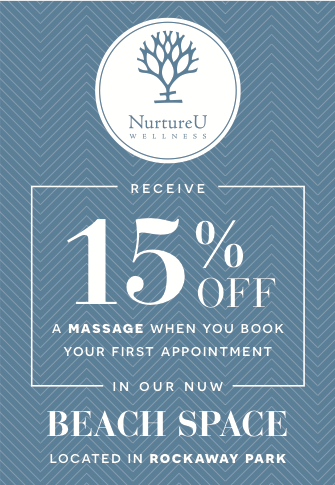 NurtureU Wellness at Rockaway, NY offers a wide variety of services to relax, heal and pamper. Whether your wellness treatment is strictly for relaxation, or to facilitate healing, NurtureU Wellness is well versed in advanced techniques in different types of massage & therapeutic healing methods. Select a single massage, or blend different services to melt your tension & stress away.